In a suspension bridge, the traffic-carrying deck is supported by a series of wire ropes that hang from massive cables draped between tall towers. The Brooklyn Bridge in New York City and the Golden Gate Bridge in San Francisco are two of the most famous suspension bridges. The Akashi Kaikyo Bridge in Japan, which was completed in 1998, contains the world's longest suspension span (distance between support towers)—6,529 ft (1,991 m); the entire bridge, including the portions between the towers and the shores, totals nearly 2.5 mi (4 km). Construction of the Akashi Kaikyo Bridge took ten years, cost $3.6 billion, and involved only six injuries (no deaths). A century earlier, construction of the Brooklyn Bridge, with a span of 1,600 ft (490 m) took 14 years and resulted in the loss of 27 lives. Suspension bridges are one of the earliest types devised by man. The most primitive version is a vine rope linking two sides of a chasm; a person travels across by hanging from the rope and pulling himself along, hand over hand. Such primitive bridges—some as long as 660 ft (200 m)—are still being used in areas such as rural India. Somewhat more sophisticated designs incorporate a flat surface on which a person can walk, sometimes with the assistance of vine handrails. By the eighth century, Chinese bridge builders were constructing suspension bridges by laying planks between pairs of iron chains, essentially providing a flexible deck resting on cables. Similar bridges were built in various parts of the world during subsequent centuries. But the modern era of suspension bridges did not begin until 1808 when an American named James Finley patented a system for suspending a rigid deck from a bridge's cables. Although Finley built more than a dozen small bridges, the first major bridge that incorporated his technique was built by Thomas Telford over the Menai Straits in England. Completed in 1825, it had stone towers 153 ft (47 m) tall, was 1,710 ft (521 m) long, and boasted a span of 580 ft (177 m). The roadway, which was 30 ft (9 m) wide, was built on a rigid platform suspended from iron chain cables. The bridge is still in use, although the iron chains were replaced with steel bar links in 1939. Another American, John Roebling, developed two major improvements to suspension bridge design during the mid-1800s. One was to stiffen the rigid deck platform with trusses (arrays of horizontal and vertical girders that are cross-braced with diagonal beams). Experience had shown that wind or rhythmic traffic loads could send insufficiently stiffened decks into vibrations that could grow out of control and literally rip a bridge apart. Roebling's other important innovation involved construction of the bridge's supporting cables. Around 1830, French engineers had shown that cables consisting of many strands of wire worked better than chains to suspend bridges. Roebling developed a method for "spinning," or constructing, the cables in place on the bridge rather than transporting ungainly prefabricated cables and laboring them into position. His method is still commonly (though not exclusively) used on new bridges. The history of suspension bridges is liberally sprinkled with examples of successful bridges that were widely believed to be impossible when proposed by a visionary engineer. One example was a railway bridge Roebling constructed between 1851-1855 across the Niagra River gorge. 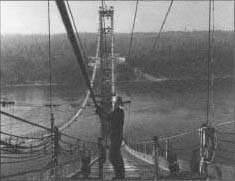 The first truss-stiffened suspension bridge, it was supported by four 10 in (250 cm) diameter cables strung between stone towers. Forty years after completion, the bridge was successfully carrying traffic 2.5 times as heavy as it was designed for; at that point it was retired and dismantled. A steel worker lying cable stands for the suspension cable of the new Tacoma, Washington, Narrows Bridge on October 21, 1949. The Tacoma Narrows Bridge was the third largest suspension span bridge in the world and only five months old when it collapsed on Saturday, November 7, 1940. The center span, measuring 2,800 ft (853.4 m), stretched between two 425 ft (129.5 m) high towers, while the side spans were each 1,100 ft (304.8 m) long. The suspension cables hung from the towers and were anchored 1,000 ft (304.8 m) back towards the river banks. The designer, Leon Moisseiff, was one of the world's foremost bridge engineers. Moisseiff's intent was to produce a very slender deck span arching gently between the tall towers. His design combined the principles of cable suspension with a girder design of steel plate stiffeners—running along the side of the roadway—that had been streamlined to only 8 ft (2.4 m) deep. The $6.4 million bridge was nicknamed "Galloping Gertie" by people who experienced its strange behavior. Forced to endure undulations that pitched and rolled the deck, workmen complained of seasickness. After the opening, it became a challenging sporting event for motorists to cross even during light winds, and complaints about seasickness became common. State and Toll Bridge Authority engineers were more than a little nervous about the behavior of the slender two-lane span, which was only 39 ft (1 1.9 m) wide. Its shallow depth in relation to the length of the span (8-2,800 ft [2.4-853.4 m]) resulted in a ratio of 1:350, nearly three times more flexible than the Golden Gate or George Washington bridges. Engineers tried several methods to stabilize the oscillations, but none worked. Witnesses included Kenneth Arkin, chairman of the Toll Bridge Authority, and Professor Farquharson. By 10:00, Arkin saw that the wind velocity had risen from 38-42 mi (61.1-67.6 km) per hour while the deck rose and fell 3 ft (0.9 m) 38 times in one minute. He and Farquharson halted traffic. Leonard Coatsworth, a newspaperman, had abandoned his car in the middle of the bridge when he could drive no further because of the undulations. He turned back briefly, remembering that his daughter's pet dog was in the car, but was thrown to his hands and knees. By 10:30, suspender ropes began to tear, breaking the deck and hurling Coatsworth's car into the water. Within a half hour, the rest of the deck fell section by section. Engineers looking into the problem of the twisting bridges were able to explain that winds do not hit the bridge at the same angle, with the same intensity, all the time. For instance, wind coming from below lifts one edge, pushing down the opposite. The deck, trying to straighten itself, twists back. Repeated twists grow in amplitude, causing the bridge to oscillate in different directions. The study of wind behavior grew into an entire engineering discipline called aerodynamics. Eventually no bridge, building, or other exposed structure was designed without testing a model in a wind tunnel. With the development of graphic capabilities, some of this testing is now done on computers. In 1869, Roebling died in an accident while surveying the site for the Brooklyn Bridge, which he had designed. His son, Washington Roebling, spent the next 14 years building the famous structure. This was the first suspension bridge to use cables made of steel rather than wrought iron (a relatively soft type of iron that, while hot, can be shaped by machines or formed by hammering). Each of the four 16 in (40 cm) diameter cables consists of more than 5,000 parallel strands of steel wire. More than a century after its completion, the Brooklyn Bridge carries heavy loads of modern traffic. Another landmark suspension bridge was built across the Golden Gate—the mouth of San Francisco Bay—from 1933-1937 by Joseph Strauss. The Golden Gate Bridge is 6,450 ft (1,966 m) long, with a main span of 4,200 ft (1,280 m). Its two towers are 746 ft (227 m) tall; they support two 7,125-ton (6.5 million kg) cables that contain a total of 80,000 mi (129,000 km) of steel wire. Despite rigorous safety precautions, 11 workers died; 19 were saved by a safety net hanging below the deck during construction—an innovation that became standard on later bridge projects. One of the most famous bridge failures in America was the 1940 collapse of the Tacoma Narrows Bridge on Puget Sound in the state of Washington. Then the third-longest suspension bridge in the world, it had been designed to be exceptionally sleek. Only wide enough for two traffic lanes and side-walks, the span was 2,800 ft (853 m) long. Rather than being stiffened with trusses, the deck was reinforced by two steel girders that were only 8 ft (2.4 m) high, with some cross-bracing connecting them. This design not only provided less rigidity than trusses, but it also allowed the wind to exert strong forces on the structure rather than passing harmlessly through an open truss arrangement. Four months after it was completed, the bridge was set into a pattern of increasing oscillations by 42 mph (68 km/h) winds and tore itself apart. The replacement bridge, built a decade later, was designed with a deck stiffened with a steel truss 33 ft (10 m) thick. Many of the components of a suspension bridge are made of steel. The girders used to make the deck rigid are one example. Steel is also used for the saddles, or open channels, on which the cables rest atop a suspension bridge's towers. When steel is drawn (stretched) into wires, its strength increases; consequently, a relatively flexible bundle of steel wires is stronger than a solid steel bar of the same diameter. This is the reason steel cable is used to support suspension bridges. For the Akashi Kaikyo Bridge, a new low-alloy steel strengthened with silicon was developed; its tensile strength (resistance against pulling forces) is 12% greater than any previous steel wire formulation. On some suspension bridges, the steel wires forming the cables have been galvanized (coated with zinc). The towers of most suspension bridges are made of steel, although a few have been built of steel-reinforced concrete. Each suspension bridge must be designed individually to take into account many factors. For example, the geology of the site provides a foundation for the towers and cable anchorages, and may be susceptible to earthquakes. The depth and nature of the water being bridged (e.g., fresh or saltwater, and strength of currents) may affect both the physical design and the choice of materials like protective coatings for the steel. In navigable waters, it may be necessary to protect a tower from possible ship collisions by building up an artificial island at its base. Since the Tacoma Narrows Bridge disaster, all new bridge designs have been tested by placing scale models in wind tunnels, as the Golden Gate Bridge's design had been. For the Akashi Kaikyo Bridge, for example, the world's largest wind tunnel was constructed to test 1/100th-scale models of bridge sections. In very long bridges, it may be necessary to take the earth's curvature into account when designing the towers. For example, in the New York's Verrazano Narrows Bridge, the towers, which are 700 ft (215 m) tall and stand 4,260 ft (298 m) apart, are about 1.75 in (4.5 cm) farther apart at the top than they are at the bottom. 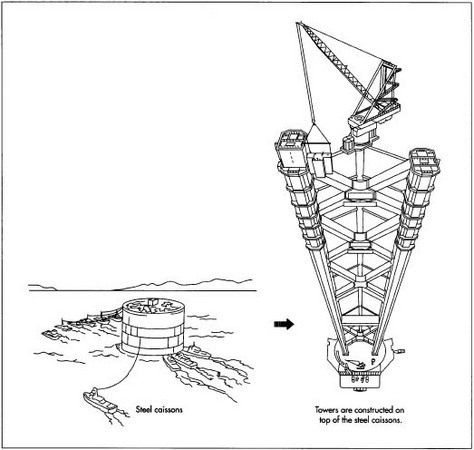 Tower constructions that will stand in water begin with caissons (a steel and concrete cylinder that acts as a circular dam) that are lowered to the ground beneath the water, emptied of water, and filled with concrete in preparation for the actual towers. major components: the towers and cable anchorages, the support cable itself, and the deck structure. 1 Tower foundations are prepared by digging down to a sufficiently firm rock formation. Some bridges are designed so that their towers are built on dry land, which makes construction easier. If a tower will stand in water, its construction begins with lowering a caisson (a steel and concrete cylinder that acts as a circular damn) to the ground beneath the water; removing the water from the caisson's interior allows workers to excavate a foundation without actually working in water. When the excavation is complete, a concrete tower foundation is formed and poured. Anchorages—structures that support the bridge's cables—are massive concrete blocks securely attached to strong rock formations. When the towers and anchorages have been completed, a pilot line must be strung along the cable's eventual path, from one anchorage across the towers to the other anchorage. tall; each of these blocks, in turn, consists of three horizontal sections. A crane positioned between the columns lifted three sections into place on each column, completing a layer. After completing a block on each column, the"bootstrapping" crane was jacked up to the next level, where it lifted the sections of the next layer into place. At appropriate intervals, diagonal bracing was added between the columns. 3 Anchorages are the structures to which the ends of the bridge's cables are secured. They are massive concrete blocks securely attached to strong rock formations. During construction of the anchorages, strong eyebars (steel bars with a circular hole at one end) are embedded in the concrete. Mounted in front of the anchorage is a spray saddle, which will support the cable at the point where its individual wire bundles (see Step 5) fan out—each wire bundle will be secured to one of the anchorage's eyebars. 4 When the towers and anchorages have been completed, a pilot line must be strung along the cable's eventual path, from one anchorage across the towers to the other anchorage. Various methods can been used to position the pilot line. For the Niagra River bridge, for example, Roebling offered a reward of $10 to the first youngster who could fly a kite with a pilot line attached across the gorge to make the connection. Today, a helicopter might be used. Or the line might be taken across the expanse by boat and then lifted into position. When the pilot line is in place, a catwalk is constructed for the bridge's entire length, about 3 ft (1 m) below the pilot line, so workers can attend to the cable formation. Once the vertical cables are attached to the main support cable, the deck structure must be built in both directions from the support towers at the correct rate in order to keep the forces on the towers balanced at all times. A moving crane lifts deck sections into place, where workers attach them to previously placed sections and to the vertical cables that hang from the main suspension cables. to keep the wires together. The wire coming off the spool is cut and secured to the anchorage. Then the process begins again for the next bundle. The number of bundles needed for a complete cable varies; on the Golden Gate Bridge it is 61, and on the Akashi Kaikyo Bridge it is 290. When the proper number have been spun, a special arrangement of radially positioned jacks is used to compress the bundles into a compact cable, and steel wire is wrapped around it. Steel clamps are mounted around the cable at predetermined intervals to serve as anchoring points for the vertical cables that will connect the decking to the support cable. 6 After vertical cables are attached to the main support cable, the deck structure can be started. The structure must be built in both directions from the support towers at the correct rate in order to keep the forces on the towers balanced at all times. In one technique, a moving crane that rolls atop the main suspension cable lifts deck sections into place, where workers attach them to previously placed sections and to the vertical cables that hang from the main suspension cables, extending the completed length. Alternatively, the crane may rest directly on the deck and move forward as each section is placed. 7 When the deck structure is complete, it is covered with a base layer (e.g., steel plates) and paved over. Painting the steel surfaces and installing electric lines for lighting are examples of other finishing steps. In addition, ongoing maintenance procedures begin. For example, a permanent staff of 17 ironworkers and 38 painters continue to work daily on the Golden Gate Bridge, replacing corroding rivets and other steel components and touching up the paint that protects the bridge. Each suspension bridge is designed uniquely, with attention given to both function and aesthetics. New materials may be used, or even developed, to make the bridge less bulky and more efficient. And innovative designers sometimes create unusual solutions to their challenges. For example, the design approved in 1998 to replace the east span of the San Francisco-Oakland Bay Bridge that was severely damaged by a 1989 earthquake is a suspension bridge supported by only one tower. Its main cables are anchored, not in the massive anchorages described above, but in the deck support structure of the bridge itself. Perhaps the most ambitious plans currently under development for a new suspension bridge are those for connecting Sicily to the Italian mainland. Because the support towers will have to be built on opposite shores of the Messina Strait, the main span will be 9,500-10,800 ft (2,900-3,300 m) long. One proposed design uses towers that are 1,312 ft (400 m) tall. Developers hope to build the bridge by 2006. Brown, David J. Bridges. New York: Macmillan, 1993. Cassady, Stephen. Spanning the Gate. Mill Valley, CA: Squarebooks, 1979. Kingston, Jeremy. How Bridges are Made. New York: Facts on File, 1985. Troitsky, M.S. Planning and Design of Bridges. New York: John Wiley & Sons, 1994. Kashima, Satoshi and Makoto Kitagawa. "The Longest Suspension Bridge." Scientific American (December 1997): 88ff. Kosowatz, John J. "Building a New Gateway to China." Scientific American (December 1997): 106ff. what are the types of materials used to make suspension bridge ? crisp and concrete illustrative tchnique employed in this document is commendable.